Acclaim is a presentation program written in Common Lisp. It does not use any widget toolkit but only CLX (Common Lisp's equivalent of C's XLIB) and a ppm/pnm to clx-bitmap converter, i.e. a modified version of image-reader.lisp of the Eclipse window manager that is available on this page. The original version is written by Daniel Barlow (see viewer.lisp). The changes by Max-Gerd Retzlaff are presented on this web page. The newest version is 0.25; date: Jun, 19th 2004, 03:16:12 CEST. I sucessfully tested it with quite actual CVS versions of SBCL and OpenMCL. The full history of changes of my branch is available at the end of this page. Yes, you have to scroll manually. As there is currently no real documentation the quite verbose history of changes is a valuable source of information! 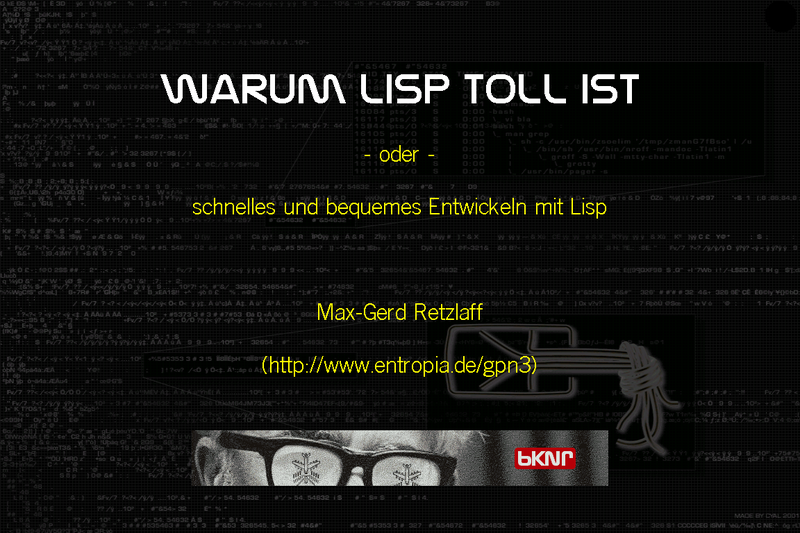 (p (line "Bereits gesagt: Die berühmten Lisp-Listen sind eigentlich Bäume. Preliminary remark: Of course, as this is a crude hack it is not included in the main branch of my Acclaim version. In a nightly coding session on the GPN3 of the Computer Club Entropia e.V. / CCC-Karlsruhe I added an Jeopardy mode. I think such a mode is vitally important and every presentation program simply has to have one. This is really a horrible hack but actually it integrates quite nicely into Acclaim. You can still use acclaim_jeopardy for presentations, and if you like you can add a (jeopardy! ...) blockinto the slide definition file just as you add a slide or a configure block, and play a session of Jeopardy during your speech. As all functionality of Acclaim is still available you can use layouted text or even images to create nice answer and question slides. Think of the unimaginable possibilities! :p600 ("This book has dust-puppy on it"
:p800 ("This book is decorated with a llama"
:p1000 ("This animal is featured on 'DNS and bind'"
Actually only the first category is shown. Think of more categories; it is quite boring to include the whole definition of the round. But if you indeed want to enjoy the whole definition (even another five rounds for free! ), select between a htmlized version or the plain Lisp version. 0.18 - 0.19: - make-element is generic function now. - Inline images are preloaded if *preload-images* is set. in a configure-block of the slide definition file. (and its images) will be loaded as acclaim itself is loaded. can only define the default font and the element "title". metaclass-foo I had in a previous version of acclaim. it off and t for enabling, respectively. (as well as additional slots for their default values). a more generic method that uses the new class slots. etc. in the slide definition files works smoothly now. are now restored before a new slide definition is loaded. - Inline images can be positioned by :x-align and :y-align. - A new function (change-host hostname). - Set *font* in #'load-slides if *display* is bound. - Set *last-foil* to 0 in #'restore-defaults. - button-press-event removed; #\Space is enough. of it, i.e. smallpre) is now wrapped. to get a blue slide with a default textcolor of green. - New elements slideset, font and page-number. when the slide is displayed (in render-slide). file but right now only the first one is actually used. the subclass smallpre will also be white. easier: No keywords just a list of element setting blocks. - wm-properties also set to Acclaim and not to Exhibition now. to get scrot (or do "apt-get install scrot" on Debian). This removes quite some complexity in my humble opinion. messages during slide loading anymore. function restore-defaults. An advantage of the new model. loaded slidesets (that are stored in *slidesets* by the way). different slide call something like (acclaim:run :foil 2). xlib:put-image (just as an inline image) which is slower. default background color (i.e. "midnightblue" at present). Perhaps this will sound a little bit schizophrenic as I spent quite some time programming Acclaim but I actually hate presentation programs. Too often they are misused. Let me put it in a provocative from: A good slide set is completely useless to understand the speech's topic. 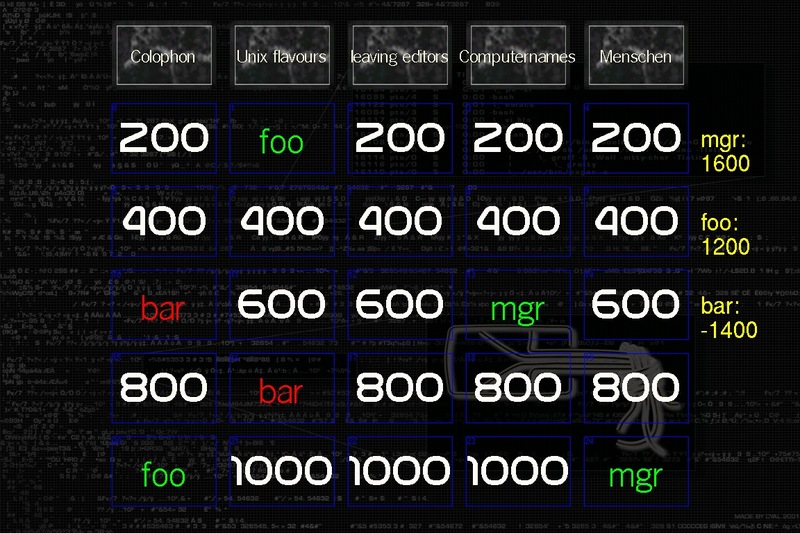 Speech means "spoken words", and look at the average Powerpoint 'speech': The main points are put on the wall as big bullet boxes and the speaker just tries to mention each of them, barely using full sentences. This has nothing in common with rhetorics! Of course you need sometimes to present some tabulars, graphics, or (short) code examples, especially in a technical speech. For this -- and only for this -- you should use the presentation program. The documentation should be a completely different thing using full formulated sentences. The idea that if you write down everything you want to mention so that the slides are usefull for people who cannot attend your speech is a bad one in my humble opinion, leading to bad slides that consume too much attention of the audience. Okay, perhaps the above mentioned is a little bit too black and white. Especially if the speaker is not (yet) used to give speeches, more verbose slides are quite nice. And the same is true if I am a little bit tired or just not very interested in the topic: When you are not listening to every word of the speech it is nice that you have some moments left to read the slide in order to get at least to know some notes of what he just mentioned. On the other hand, as I already have mentioned, if the speaker has the urge to stick to every word he or she had written on the slides these slide themselves can actually cause the tediousness. Written on June, 16th 2004.